This week, geeks and pop culture fans will descend on San Diego in droves to share their love of and learn more about their favorite fandoms, performers, authors, and artists. San Diego Con Comic is the place to be for fans. Its tickets are hard to come by, making it an experience on many geeks’ bucket lists. As SDCC’s popularity has risen, more and more people are seeking out smaller conventions offered throughout the United States and around the world. Cons began more as events designed for adult comic fans. As the years have gone by, comic conventions have morphed more into pop culture conventions. This change has increased the appeal of these events and cons are drawing larger crowds each year. These larger crowds are comprised of not only adults and teens, but children 12 and under. Comic and fandom conventions across the globe are gaining more young attendees each year. Attending a convention as a family can be quite the memory building experience. Families can begin their experience before even stepping on to the convention floor. 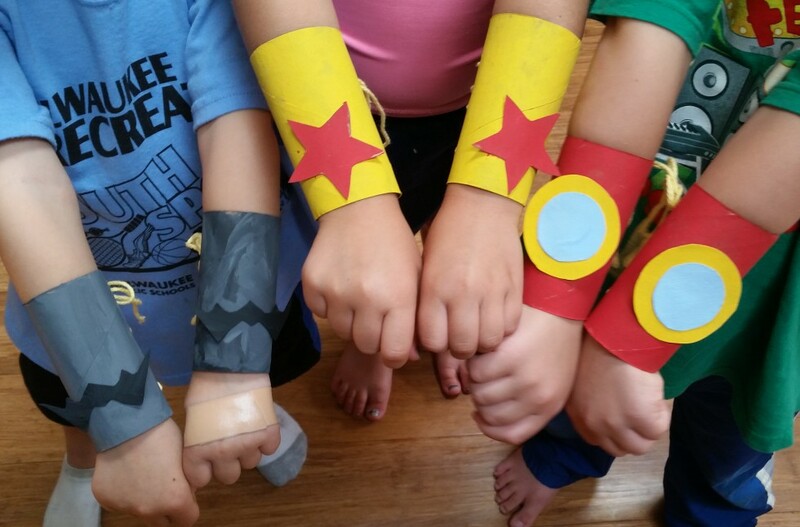 Planning and creating costumes to cosplay at an event can be a fun way to prepare younger attendees. Costumes can be as simple as last year’s Halloween costume or as complex as building and sewing each piece of an outfit from scratch. Another choice for families could be to get themed shirts or theme their costumes as a group. No matter what a family wears, the family conversation of what to wear always gets the creative juices going and usually produces entertaining discussions. Our kids get so into designing their costumes, that at times we have to remind them of our skill level and how much time we have to build. Nevertheless, the planning and creation of our family’s cosplay is one of our favorite parts. Another way to bond before the con, is to look at the event’s guests and programming and make a plan as a family. Getting everyone’s input to what interests them at the event, prior to the day of, helps with time management at the event. It also provides families with younger children the opportunity to find activities best suited for their children’s age groups. With so much programming offered at conventions, it is best to plan ahead. These events also offer children, with interests and passions that are a little less mainstream, a chance to explore what interests them and meet other children like them. It could also be a chance for kids to introduce their passion to family members that may not be familiar with what they are into. My then 8 year-old daughter convinced us to attend our first con. Watching her interact with children that shared her same interests and her level of joy from being in a place that accepted her warmed our hearts. Cons provide young attendees opportunities to immerse themselves in a unique culture and community of people that showcase the fun side of geeks that is exclusive to comic cons. Attending comic cons and fan events has become one of my family’s favorite things to do. Initially, I wasn’t sure I wanted to take my children to such events, but I have found that cons are becoming more family friendly and aren’t the daunting adventure they once were for those bringing kids. Many cons now even have family days, which are probably the best days to go for children attending for the first time. Also, some are even offering activities for children under 12; like costume contests and scavenger hunts. It all depends on the convention. Attending a convention or fan event is definitely something fans young or young at heart should try to do at least once. If the thought of attending a comic con with your child sounds like something you may want to try, check out below what my friend has to say about taking her 4 year-old to a con. She writes about her prep prior to the event and all the options she considered before finalizing her plans. Prepping your child for their first comic con experience can be a very exciting thing for both of you! However it can also become a very big challenge. Over stimulation, too much confusion, and getting bored of visiting the various tables are just a few of the things that your younger child may have to deal with. In general when you attend a con, the 4 day pass is a much better deal than just doing a 1 or 2 day visit. This does not mean that you are required to take your child all 4 days just because you are going. I have a 4 year old boy who loves super heroes and is really excited about going to his first comic con, however in the end I decided that taking him all 4 days would just be too much stimulation and I would end up paying for it in the end. This is a decision you have to make for yourself, but make sure that you have other fun things planned for your little one who may not be attending every day with you. I personally have a slumber party planned (that will be super sports themed) for my son the day he isn’t going with me. I also know that my friend plans to spend special time with her 5 year old son while her husband takes their older daughter all 4 days. The next step you will want to plan will be to cosplay or not to cosplay. My husband and I debated this subject for a while before I won because I was going to be cosplaying and our son loves to dress up. Even at the young age of 4, my son had very distinct ideas about who he wanted to dress as and what he wanted me to dress as. At first I planned on making all of his cosplay demands DIY style. Why? Because I thought that I was going to be super mom! Reality quickly set in to my DIY plans. But I figured out that my son wasn’t as in to the “made by hand” title, as much as he was in love with looking like the characters. Realize that young children have grand ideas, and sometimes all you need to do is get them on amazon to find the cosplay of their dreams. I actually found all of my son’s costumes for a really good price, due to off Halloween pricing, through Amazon. I did have to make some minor hemming fixes on his costumes to make them fit better, but that is so much easier than making all of these on my own. Actually my son got a bigger kick out of getting to duck tape my arm for my Winter Soldier cosplay than he did with any of his costume pieces. However I do have to say that if you have an older child going with you having them plan out and create their own costume is huge! You can even make it into a teachable moment, give them a budget and let them pick out the materials, pieces or parts they would like to create! That way they get to take a sense of pride and accomplishment in their cosplay. Another fun step we did was to check out books from the library that focused on the characters my son was dressing as (Robin, Falcon, and The Flash). We found that there are very few Robin books to be found, and even in the Batman books he is very rarely mentioned. This is another great way to bring learning into the comic con world. I also did a few art projects to go along with the books, we made a popsicle stick falcon with coffee filters, we drew a picture of what the Flash looks like when he is running (basically a lot of really colorful lines), and even made a Captain America shield out of paper plates and aluminum foil! In parting, when finally the day arrives and your child is ready for their debut to comic con make sure that you have all of your plans set as well as back up plans and back up plans for those back up plans. I mean fate favors the prepared…right?